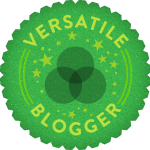 I was nominated for the Versatile Blogger Award and that itself is amazing. Thanks to Kyo1986 who nominated me, her blog is here and I hope y’all enjoyed this not so beauty related post. And I am doing this post backwards… oops. 1. I am a HUGE fan of NCIS and NCIS: Los Angeles. 2. I always wanted to be a spy or a ninja. Either or. 3. I have an unhealthy addiction to Youtube. 4. I am born 1991 which was Year of the Sheep thus the blog name. 5. I practice martial arts for pleasure (and not because I am Asian). 6. My favourite drink is Odwalla’s Mango Tango fruit juice. Best stuff ever! 7. I love to sing and my favourite songs to sing are all Disney songs. Sorry it’s all I know. I feel bad for this section because I don’t visit too many blogs… slightly embaressed but I managed to look through and find the top 10 that I love. Thanks again to Kyo1986 for nominating me! I am extremely thankful. Nuh, its very easy to read (not to learn tho :s) I don’t say anything important anyway. Well, I love all characters.. Maybe, just mayyyyybe I am a little more Tony fan, and Abby fan! But I love all of them equally. Hey there, I’ve nominated you for a Versatile blogger award! check my blog for further instructions! 😉 < guess this is your second nod then!